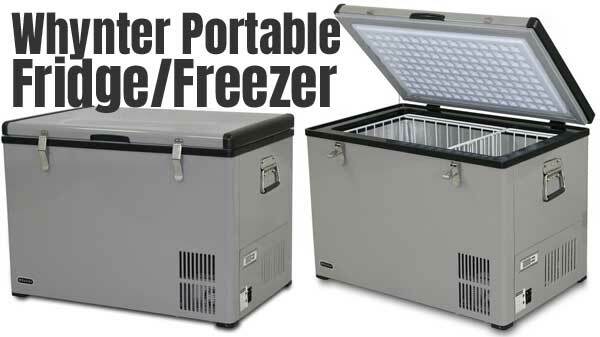 Do you need a mobile refrigerator/freezer while you travel? The smaller 12-volt car coolers just won’t cut it. You may want a unit like the Whynter Portable Fridge Freezer that works off compressor cooling rather than thermoelectric. Not only can you cool and freeze items, this device can do both at the same time! In addition, this portable unit comes with a “Fast Freeze” feature. 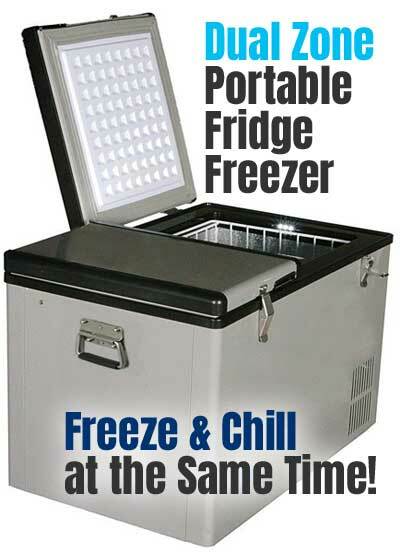 In other words, it works to quickly chill (and freeze) food and drinks you put in the cooler. Use it when hunting, fishing, tailgating, sporting events and more. It works with either a standard household 110 Volt outlet or a 12 Volt power source, so you can use it all over the place! The following video reviews the Whynter FM-62DZ and compares it to the Dometic CFX-65DZ. You can see a full review of the smaller Dometic CFX-50 here. In summary, he mentions that the Dometic typically costs more up front but uses less energy when running. It also runs more quietly. Therefore, if you plan on using the fridge/freezer in a vehicle where you will sleep, keep this in mind. Compared to the single-lid Dometic, the Whynter has 2 separate doors for the different compartments. This may or may not matter to you. The Dometic also includes a handy USB port for powering up other electronic devices. Alternatively, you can save yourself a couple hundred bucks and forgo the dual zone feature. 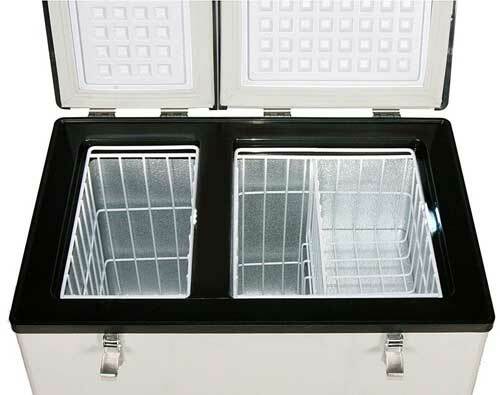 Since you don’t get 2 separate compartments, you can’t freeze and chill at the same time. However, you do get more interior storage space (65 quart VS 62 quart). Note: You can also get this model in a 45-quart or 85-quart size. Does your Whynter Portable Fridge Freezer Need More Insulation? Some people opt to get the Whynter insulated travel bag as well. It adds an extra level of insulation, which allows the compressor to cycle less. Plus, users have commented that it extends battery life. By the way, the 65-quart travel bag fits the 62-quart dual-zone fridge/freezer too.